"Here's some interesting numbers on Lake Garda Statistics"
Lake Garda is the largest of the Italian Lakes. It covers an area of 143 square miles (370 square kms). The total length is 34 miles (54kms), and the width varies from 2 miles (3 km) at the narrowest part to 11 miles (18 km) at the widest part. The total shoreline, or circumference, of Lake Garda is 90 miles (145km), of which there is over 28 miles (45km) of free beaches! The shores of Lake Garda are 65 metres above sea level. The Sacra River feeds Lake Garda from the North end of the lake near Riva ('Riva' means River). Lake Garda is drained by the Mincio River, which flows south to the River Po - the longest river in Italy. The average amount of time the lake water stays in Lake Garda before flowing out is 26.8 years, another fascinating Lake Garda statistic! Lake Garda has a maximum depth of 346 metres (1131 feet). The deepest part of the lake is 281 metres (919 feet) below sea level. The average depth of Lake Garda is 136 metres. Take a look at our map above. 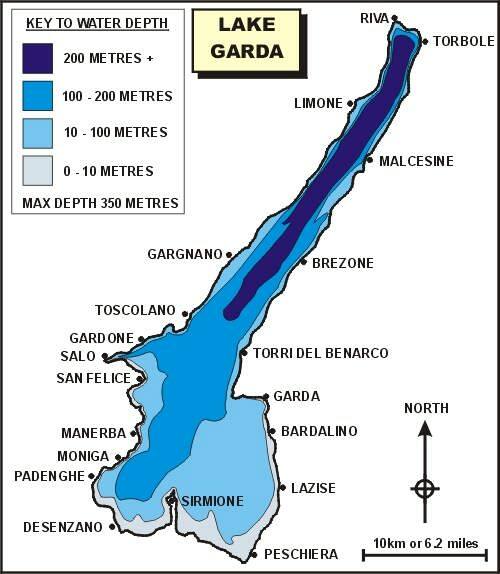 There are only 5 islands on Lake Garda, none of which are significant in size. The largest island is Isola del Garda, followed by the Isola dei Conigli ("Rabbits' Island") or San Biagio. The other smaller islands are called Isola dell'Olivo, Isola di Sogno and Isola di Trimelone.